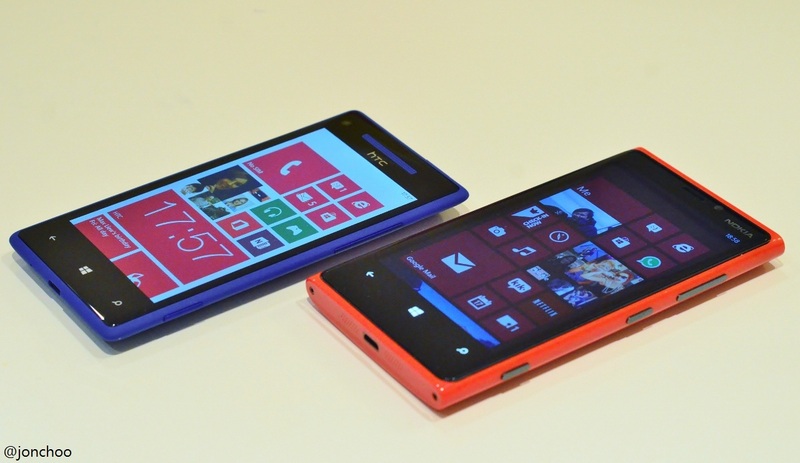 The HTC Windows Phone 8X and Nokia Lumia 920 are two of the best Windows Phone 8 smartphones currently on the market, so it makes sense to put these two head to head. Consider this a rematch of my HTC Radar vs Nokia Lumia 710 post. Both the 8X and Lumia 920 are first generation Windows Phone 8 smartphones and comes powered by Qualcomm's Snapdragon S4 SoC with a pair of Krait CPU and Adreno 225 GPU. 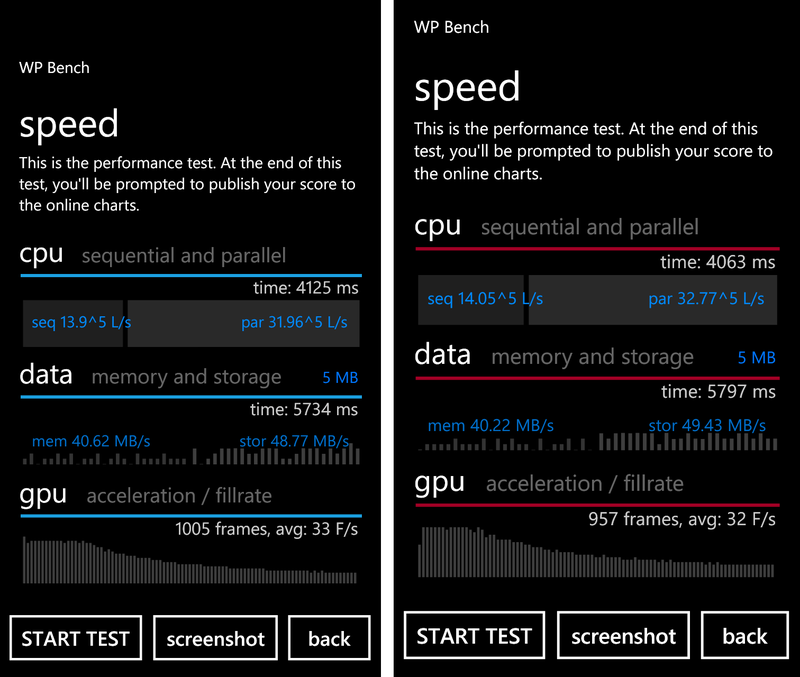 Both these devices are clocked at a modest 1.5GHz speed and are augmented by 1GB RAM. While the SoC here is regarded as mid-range, the processor is more than capable of everything thrown at it. Windows Phone 8 appears to be efficient. The Lumia 920's 4.5" display is a tinge larger than the one on the HTC Windows Phone 8X. With a smaller display, the HTC 8X's 4.3" screen features a slightly higher pixel density and hence sharper, on paper. In real life, there is little to distinguish between the two when it comes to sharpness, though the Lumia 920's has an advantage when it comes to outdoor readability and display sensitivity, and its high contrast ratio thanks to Nokia's proprietary ClearBlack Display filter. Regardless, whichever device you go for, you won't be disappointed by the display. Despite the almost similar size in screen and thickness, the 8X is significantly slimmer due its narrower aspect ratio. Keep in mind that some apps, such as Netflix, has not been updated to support the new 16:9 aspect ratio, as used by the 8X. In terms of wireless connectivity, the HTC 8X and Nokia Lumia 920 are rather common. Both have a quad band 3G chipset capable of next generation DC-HSPA+ speeds (LTE models are also available), A-GPS with GLONASS support, Bluetooth and NFC. 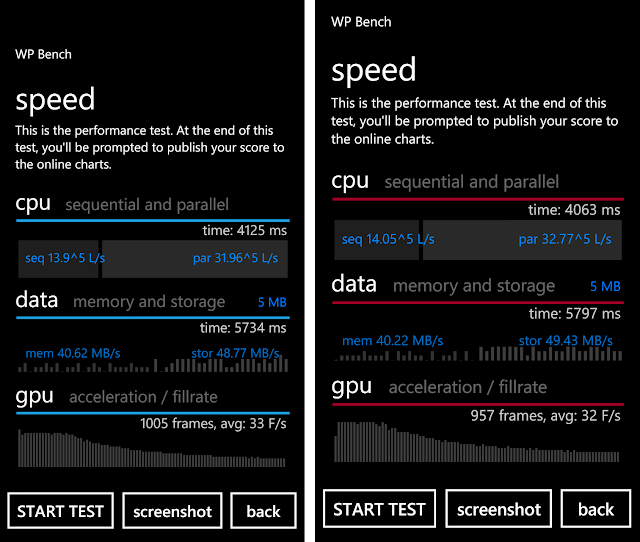 Storage is limited to a partly 16GB on the HTC 8X and reasonable 32GB on the Lumia 920. Unfortunately neither supports expendable storage via removable media or USB. The 2000mAh battery on the Lumia 920 is larger than the 1800mAh battery found on the 8X, but both offers similar moderate performances - meaning power users will always have to carry an external battery pack. Both batteries are not user replaceable. The Lumia 920 also supports Qi contactless charging, where as only selected versions of the 8X has built in support for wireless charging. Both the Lumia 920 and HTC 8X contains a camera module featuring a back illuminated sensor, that allows better low light photography. Based on tests, the Lumia 920 does have the offer hand when it comes to low light photography and video. The inclusion of optical image stabilization with the Lumia 920 also meant it has an edge when it comes to eliminating hand shakes in video shooting. On the other hand, the Lumia 920 currently suffers from a bug that more or less render day light photography an almost useless feature - a bug that Nokia has promised to fix. The HTC 8X's camera output's image quality comes short of the One X's incredible camera, which is a darn shame, but like the One X, the shutter lag is almost nil. Both camera's focal length comes out at just wider than 28mm. It is nice to see HTC putting renewed emphasis on the front facing camera, a feature that every manufacturer seems content with ignoring. The 2.1 Megapixel camera is paired with an ultra wide angle lens allowing a user to easily fit more into a shot. It isn't meant as a replacement for the main 8 Megapixel camera, but it also means you can easily capture a decent portrait pictures for Facebook of you and your friends without having to resort giving your phone to a stranger or using the back camera awkwardly. Short of installing a secondary back display, this is a great feature, one that I hope other manufacturers will start paying more attention to. Both devices features a unique unibody polycarbonate (posh plastic) design. I wouldn't exactly say the HTC 8X is attractive and the weird colour scheme does detract from what it could be, but the build quality is brilliant. There are no flexes and the matte rubber'ish finish of the body helps prevent scratches. In spite of everything, I did wish HTC reused the One X/S design for the 8X. The Lumia 920 is also solidly built, but the glossy finish does take away some of its class. When it comes to handling, I found the Lumia 920 just a tad too heavy for my liking. 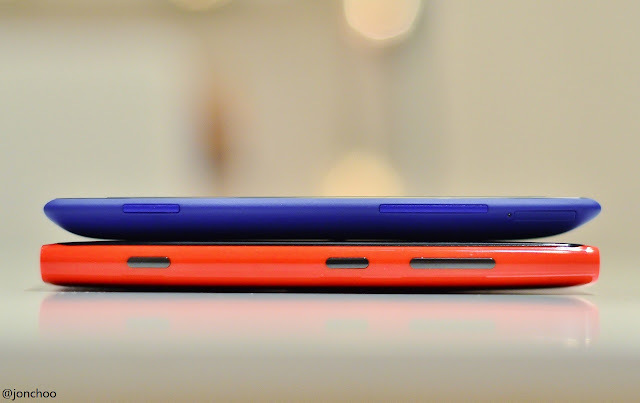 The 8X however is almost perfectly sized, and feels better thanks to the tapered side. The Lumia 920's biggest strength is the amount of value added proprietary applications from Nokia aimed at enhancing Windows Phone 8 further. With free navigation via Nokia Map and Nokia Drive, free music streaming via Nokia Music, free public transport navigation via Nokia Transport and image manipulation via Creative Studio, Nokia has been very proactive in making their devices stand out among the Windows Phone OEMs. Expect Nokia to continue churning out more exclusive apps for their Lumia range. Sadly, Nokia's commitment doesn't extend to quick firmware rollouts, with their latest firmware update still MIA from international sim-free devices. HTC's commitment to Windows Phone platform is questionable, but they have done well, all things considered. The number of token applications available from their HTC branded store appears to have been reduced from their Windows Phone 7 days. For example, HTC Watch, a movie renting app; as well as HTC Connected Media, a DLNA app, are curiously missing. On the other hand I am impressed with how quick Windows Phone 8 Portico has arrived on the 8X, with updates on sim-free devices available since early December last year. Do not forget that Nokia Drive is also available for the 8X (as well as other branded Windows Phone 8 smartphones), and the default Maps app is already powered by Nokia. If you are on the market for a high end Windows Phone 8 device, you can't go wrong with either the HTC 8X or Nokia Lumia 920. Ultimately which device you choose depends on the importance of each manufacturer's product differentiation. The Lumia 920 would win based on features and value added offerings, but the 8X does hold its own, even with its storage handicap, by featuring a more portable design and a usable front camera. The 8X's biggest advantage is its pricing - it is a good £120+ cheaper than the Lumia 920 sim-free, making it the most affordable Windows Phone 8 device with a HD display currently on the market. The Samsung Ativ S, which costs somewhere in between the two, should also be on this list, but it would be too late to obtain one to meet my arbitrary deadline for this post. Next time perhaps. But if you are in the market for a new Windows Phone 8 device, it would be unwise to ignore the Ativ S. Where it may lack the design and form factor of the HTC 8X and Nokia Lumia 920, it more than makes up with its included features, such as expandable storage and user replaceable battery.